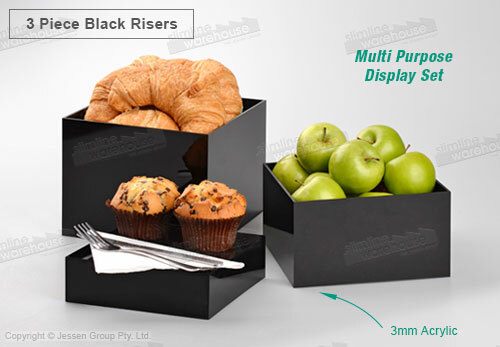 This black riser set has (3) different sizes of pedestals included, making it easy to create an eye-catching display that draws in passersby and helps get them interested in your products. Different configurations are possible as well, using the different heights to make an eye-catching merchandising display. The acrylic displays are versatile, able to be used as a riser with products raised in height, or as a container to hold round products or just offer a different look. Each black riser is made from 3mm thick black acrylic, which offers a reflective surface for a sleek look that helps to really call out to potential customers. The pedestal risers set are versatile, able to be stacked on top of each other or nested inside when using less to make the right looking display for your current needs. Order today for fast despatch and to set your retail store, jewellry shop, make-up counter, bakery, restaurant, or cafe apart from the competition! This product is currently in production and is due to ship in 36 days. To place a back order, please complete the checkout process as normal.